Do you like to rent a trike? Don’t worry. We will explain how you can easily rent a trike at our trike rental station. What requirements do you need to rent a trike? You simply need to be older than 25 year and you need to have a valid drivers license for a car. If you are able to fulfill both requirements you can rent a trike. 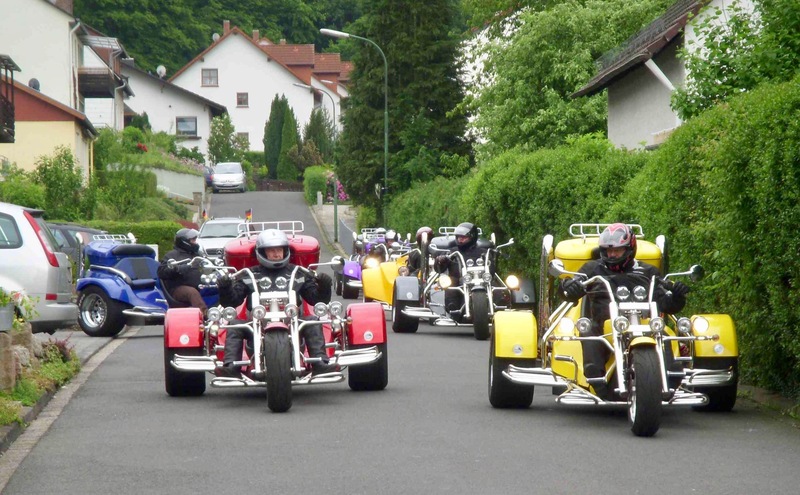 All our trikes have an insurance with a deduction of 400 €. When you pick up your trike we keep a deposit of 400 € from you. Do I need to pay in advance? To settle the reservation we take half of the rental price as a deposit in advance. As soon as we received this amount the contract is valid. Who is allowed to drive the trike? Only by us introduced drivers are allowed to drive the trike. You are not allowed to pass the trike to somebody else. How to rent a trike? To make the Reservation simply call: 0049 6661 4526 or send an Email to trikeworld@gmx.net. If you like to make a reservation at german bank holidays please do so as early as possible as this are usually well requested rental days. How many trikes can I rent? We are the biggest trike rental station in Europe. Big groups are no problem for us. As we built, buy and sell trikes constantly it is not possible to give you a maximum number in advance. Groups of 10-20 trikes are possible. If you like to request a booking for a large group of people just call us and we will take car: 0049 6661 4526. What kind of trikes can I rent? Our rental trikes are from Rewaco. We have different models in our trike fleet. You can rent trikes with two or three seats. What does it cost to rent a trike? Please have a look into the table below. This table shows you our actual price list. Beside the Trikes you can also rent helmets and rain protection clothes. Use this form to request a rental. We check the information you send to us and confirm the reservation. Please keep in mind that the reservation is only valid when we received the deposit. We will send you the price and the deposit amount by Email. I like to receive the trikeworld newsletter to get Information about special offers and events.